For many of us, growing tomatoes or squash is a simple, satisfying way to spend summer afternoons and feed our families. For Hasta Bhattarai, a refugee from Bhutan who was resettled by RefugeeOne in 2008, gardening is all that and more: it’s a way to live out a legacy that goes back generations. 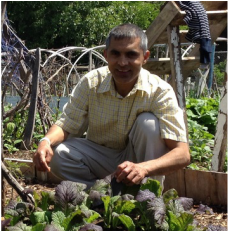 As a coordinator of the Global Gardens Refugee Training Farm, he uses his knowledge of farming to help build community among refugees in Chicago. Bhutan, where Hasta was born, is a small country in the eastern Himalayas. Though it’s known for being the only country that measures Gross National Happiness alongside Gross Domestic Product, Bhutan isn’t always a sunny place—especially not for the Lhotshampa. Descended from Nepalese immigrants who arrived in Bhutan in the 19th century to work as farmers, the Lhotshampa (which means “southerners”) preserved Nepalese traditions even as they thought of themselves as citizens of Bhutan. But by the 1990s, the Bhutanese government had branded the Lhotshampa as illegal immigrants—despite the fact that their families had been working the same farms for generations—and targeted them for harassment, violence, and even deportation. In 1992, after Hasta graduated high school, the government forced his family from their farm and out of the country. He and his parents, brother, and sister traveled to Nepal, where they settled in a camp alongside other refugees from Bhutan. There, separated from the country and work they had known all their lives, the family waited. Though the wait was punctuated by moments of happiness—Hasta met and married his wife Chandra in Nepal, for instance—it was hard to be in perpetual limbo without citizenship anywhere. After sixteen years, Hasta and Chandra found out that they were to be permanently settled in Chicago, and better yet, that his parents and siblings would follow. They were greeted by RefugeeOne staff at O’Hare in August 2008, and taken to their new apartment. Soon after, RefugeeOne helped Hasta connect with his first job: working in a restaurant at O’Hare. As Hasta and his family found their bearings in their new city, he wanted to give back to other refugees. In 2012, he had a chance to do just that when he became one of three leading volunteers at the Global Gardens Refugee Training Farm. 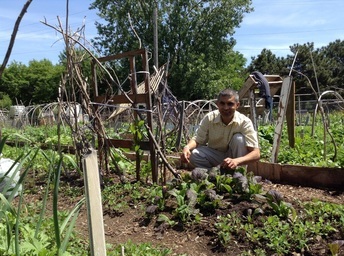 The farm is located in Albany Park and holds about 100 forty-foot-long plots tended by refugees, who grow crops familiar and novel to feed their families and sell at a weekly market. The farm includes community garden plots for neighbors, too. Hasta and his fellow volunteers write grant proposals, tackle organizational issues, and get their hands dirty with the other farmers.